We had this Pasta for dinner some time last week. It was so good and the girls liked it so much that I decided to share with you all. 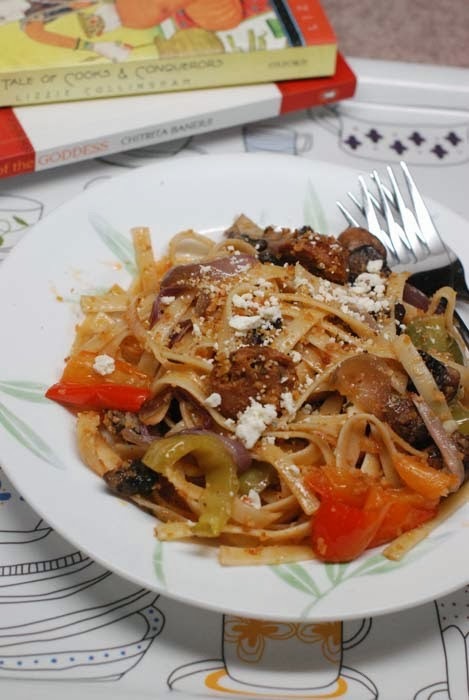 Also maybe I would want to make it again, very soon, and I would be moving heaven and earth trying to find the Pasta recipe that I just did on 26th September, 2013 or was it 25th ? But I would never find it because a) it would all be in my mind and b) I forget things that are on my mind. So for benefit of mankind and myself, here is the recipe as I made it. 1. Chop veggies like pepper, mushroom, onion. Toss in Olive oil and salt. Pop in oven at 350F for say 30-40 mins. 2. While veggies cook, you can do several other things, none of which should involve stressful activities like doing power yoga. 3.If you still have time from doing non-stressful activities, put a big pot of water to boil. Generously salt it. 4. Cook pasta according to package directions. I had Fettuccine and the box said "cook for 10-12 minutes" and so I chose 13. Once pasta is done, drain and reserve some pasta water. Toss the pasta in olive oil and keep aside. 5. While the pasta cooks, for 13 minutes is a looong time, put a a frying pan on fire. Yes, you heard it right. 6. Warm up some olive oil in there. Add a good amount of minced garlic and stir around a bit. Gahhhlic is important. For your breath. 7. Once the garlic is fragrant add some chopped sausage if you have or want them in your pasta. Follow with a tbsp of marinara sauce from the jar. Again, if you don't have the tomato sauce, fine, go and add a tbsp of ketchup. This pasta thing is very free wheeling as long as you are not Italian. 8. Throw in the almost-done veggies from the oven and toss with sausage etc. 9. Now put in the cooked pasta. Add some salt to taste. Sprinkle little of the pasta water and toss the pasta along with veggies. Add a splash of olive oil if you feel that is the right thing to do. 10. Meanwhile put a cup of breadcrumbs into a oven safe tray and toast in the oven for couple of minutes. You can use fresh for that is best but I had the store bought seasoned kind. 11. When you taste and all feels fine with the world add some...Guess what ? Add some of the toasted bread crumbs!!! Yes, yes. Breadcrumbs. I had no idea that people add breadcrumb to pasta until I saw this. Toss the pasta with breadcrumbs. It is excellent. 12.And since there has to be a twelfth commandment for 11 is an odd number to end a list, garnish with some fresh basil and add feta if you so wish. Then dig in. Now something that is totally unrelated to Pasta. As in "Pasta se koi wasta nahin". If you have by any chance read through my book, you would get a general idea that I am not the one who has perfectly matching accessories and high sense of fashion. I am severely challenged in that area. That does not preclude my being friends with fashionistas though. 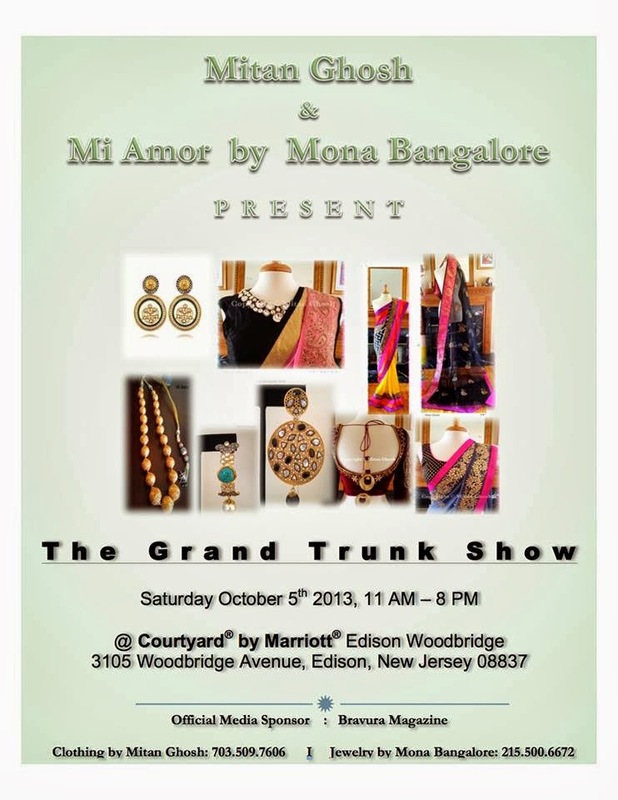 Many of my friends are impeccably turned out and have a very acute sense of what earring complements which high heels. 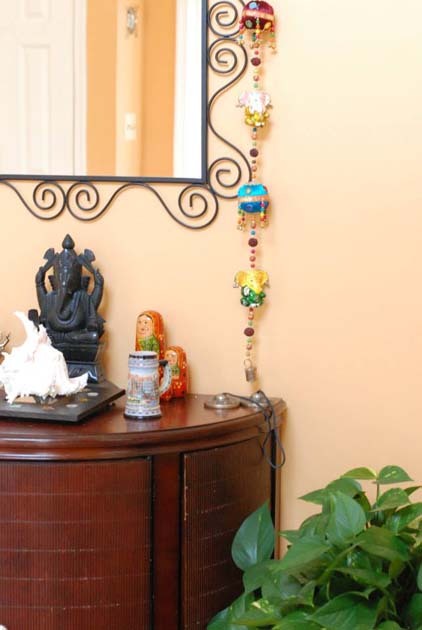 One of them is this lady who has been creating waves with her beautifully designed sarees. 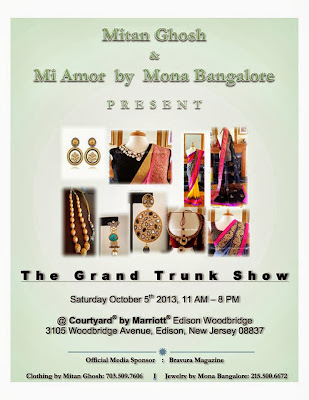 If you are in the area and you want to catch a glimpse of her exquisite creations do stop by her exhibition on Oct 5th. 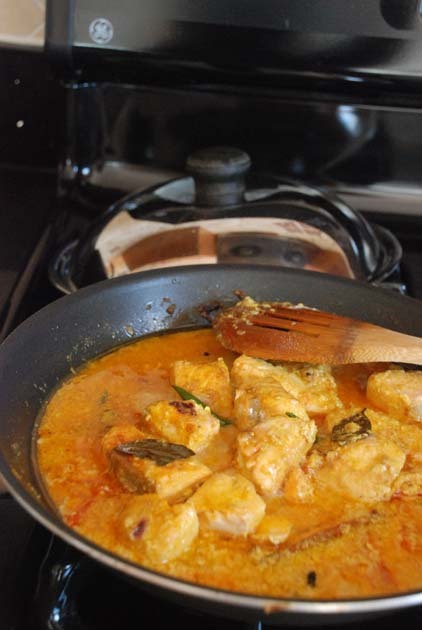 What is "The Indian Fish Curry" ? I have no clue. I just named it thus. I have been clueless since yesterday. Yesterday, I spilled tea on LS's homework. The very first homework that she brings back back from Kindergarten. The one single worksheet which asked her to color all objects which start with a letter M. Objects as in, pictures of objects in an A4 sized worksheet. So here I am calmly drinking my tea at the kitchen table while she is very importantly coloring the "mitt" , proud to have at least some homework compared to the loads that her fifth grader sister brings in. And then I shoot out my hand to point out that maybe it is a nice idea to color within the lines. And my shot out hand actually knocks off my cup of tea which spills part on her worksheet. No one is harmed, except for the worksheet. And my ego. LS wags her finger at me and says "This time it is not my fault at all. Puro tomar dosh. All your fault." I nod my head in agreement and say "Sorry" umpteen times. We also mop up the worksheet which is now stained with my red label chai and set it to dry. I fear LittleSis would be hopping mad. Surprisingly she isn't. She takes a certain pleasure in the fact that it is all my fault and then asks me if I have to make more tea for myself as there was none left for me to drink. Tea is important to me. Then I print more worksheets. I don't get the exact same one on internet so I print something similar. She does not complain and does the homework again. And at that point, I am a bit ashamed. If it had been my important work which was messed up by the kids spilling something on it, I would have shouted, given them a scolding and then a lecture on how to be more careful. And then I would have showcased that incident as an example for all of life's future lessons that I have planned for the girls. "Remember that purple grape juice, the one that you spilled on my..., did you realize how it could have triggered global warming and war in Syria?" I would have droned. LS with all her anger on her nose tip showed more composure than me. While I am pretty generous with scolding my girls, I do realize that there is a lot to learn from them each day. Like the way BigSis is ready to take up harder tasks at school and the way she is comfortable facing a large crowd on the piano, scares me downright. When LS does her somersaults, stands on her head and tries to do cartwheels, I flinch and think how I can do none of those. They say children learn from their parents. It happens the other way too. Only I can never do cartwheels or play the piano. Ever. 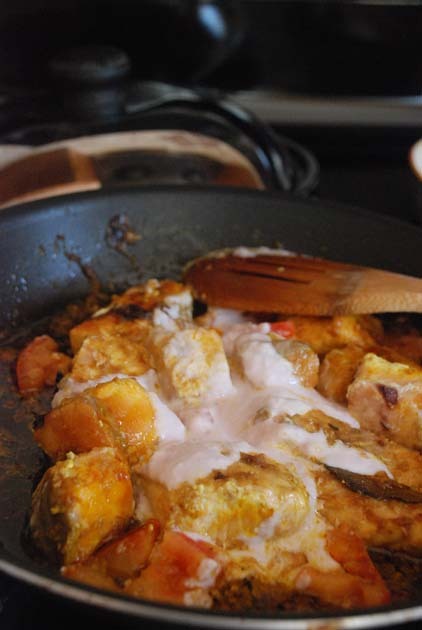 This Fish curry which I have so generously named "The Indian Fish Curry" as if it is a representative of the 1.23 billion people in India, is a curry which probably no one has ever had or even heard of. 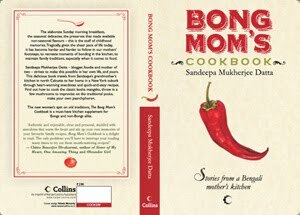 But then it perfectly represents the country as it is not from east, west, south or north but is a dish which happened when I closed my eyes and started throwing things like tomatoes, mint, coriander from the refrigerator into the blender and then borrowed the tempering of tej-patta and methi seeds from my Mother's tomato fish curry. It is a blend. And a spicy, tangy one at that. Also when I googled "Indian Fish Curry", my browser was flooded with curries from a lot of non-Indian sites shouting hoarse their best curry and some even claiming to be from Bengal. Couldn't be left behind I thought. 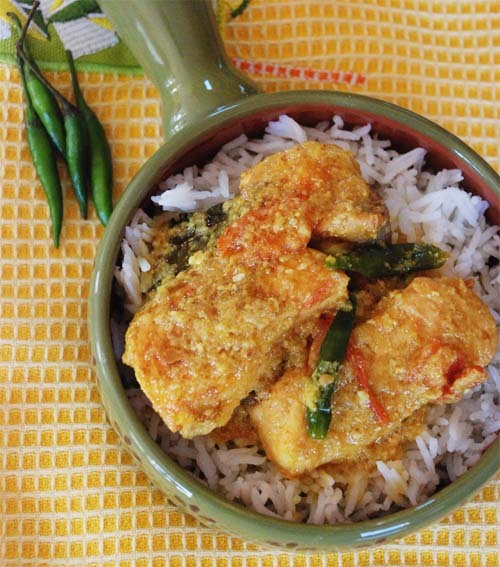 If the world wants "Indian Fish Curry", I am all up for it. I wish I could say this dish reminds me of "Desh ki Dharti" and smells just like the river that meandered right past my house. But nothing like that happens. Nevertheless it is a darn good curry and tastes beyond borders. And that river was a good 15 minutes from the house. Buy Fish. Most important step. This is a versatile gravy and so you can choose almost any fish. Only not Hilsa. 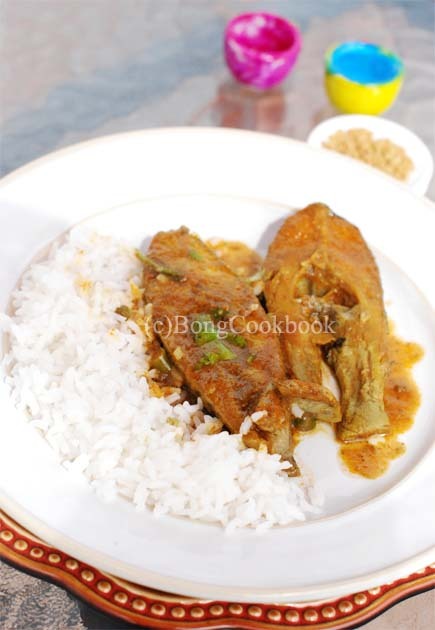 Never embarrass a Hilsa with "The Indian Fish Curry". BTW I bought Tilapia from the Asian Market which was cut in steak pieces. I used about 6-8 of those steak pieces for this gravy. Rinse the fish pieces. Pat them dry. 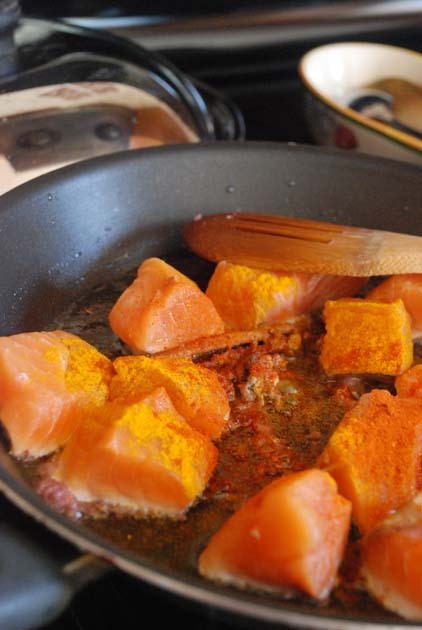 Now rub them with salt, turmeric powder and leave them aside for 15-20 minutes. At this point, which means 20 mins after the previous step, you are supposed to fry the fish. Fry in hot mustard oil. But thanks to my friend R, I no longer do this. I just broil the fish in the oven. So drizzle some oil on the fish. Choose mustard oil if you wish. Then pop them in the oven to broil. I have a toaster oven which has a broil setting and 25 mins in there, the fish is done. 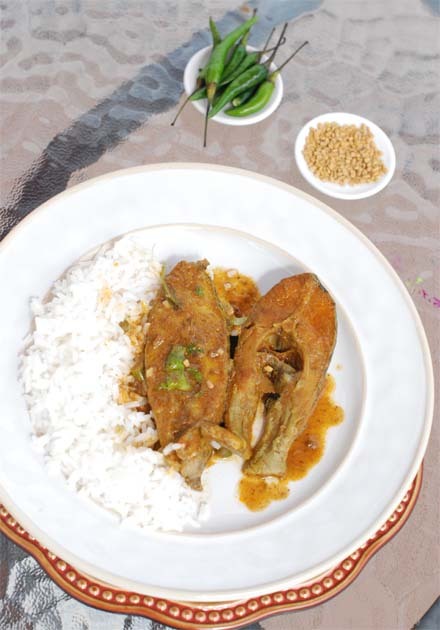 Of course your neighbor aunty from Kolkata will nod her head and say "tch-tch" and that nothing tastes like a fish fried brown in Shorsher tel. Smile and ignore. Heat some oil in a kadhai. Mustard oil should be good but any other will work. 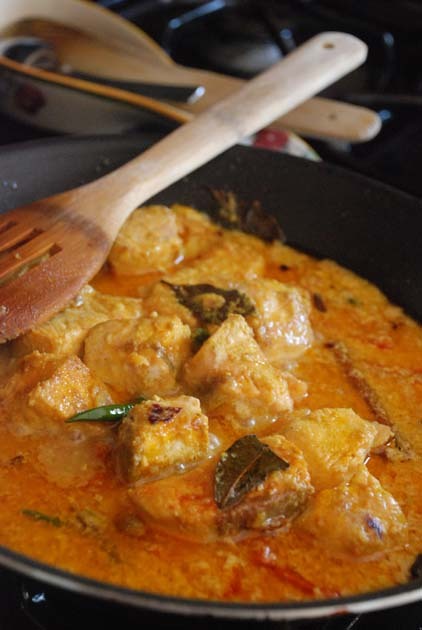 Few of you might disagree on that but what is "The Indian Fish curry" if there are no discords and disagreement. 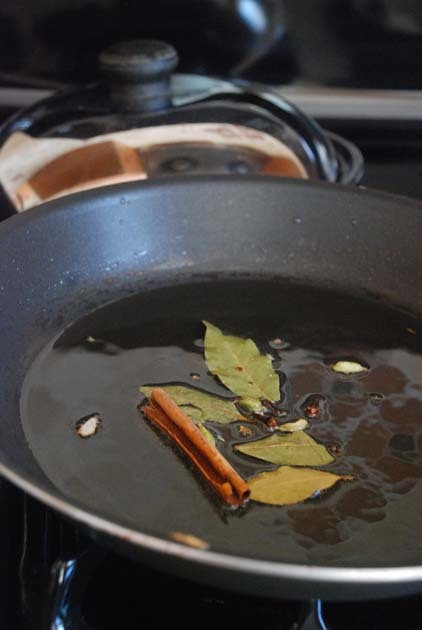 Once the oil is flavored, add the paste you made. Fry the paste till oil starts separating. Unity in diversity.We all know that is what boosts the taste. Add this to the kadhai and saute for a minute at low heat. 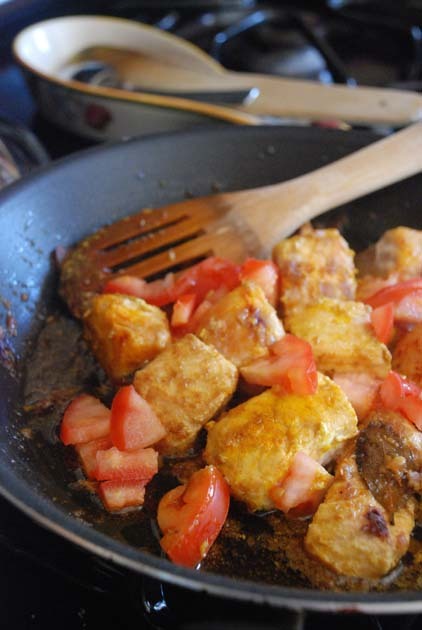 Now add the broiled fish pieces and saute with the masala for a minute. Add about 3/4th cup of warm water, salt and very little sugar to taste, 2 green chilli finely chopped and let the gravy simmer to a boil. 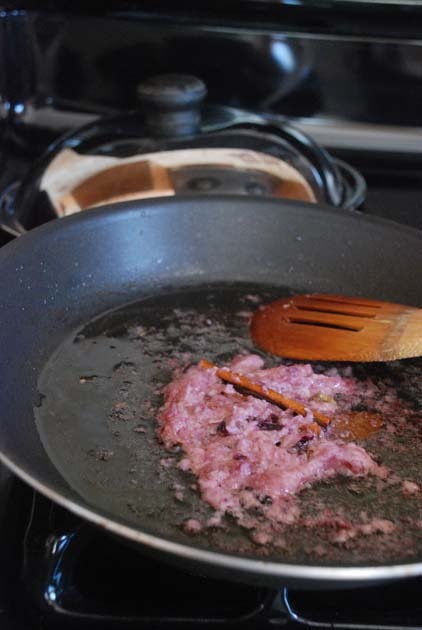 Once the gravy has reached a consistency which is not very runny, switch off heat. Sprinkle some chopped coriander leaves and cover the kadhai. Let the curry soak up the flavor. 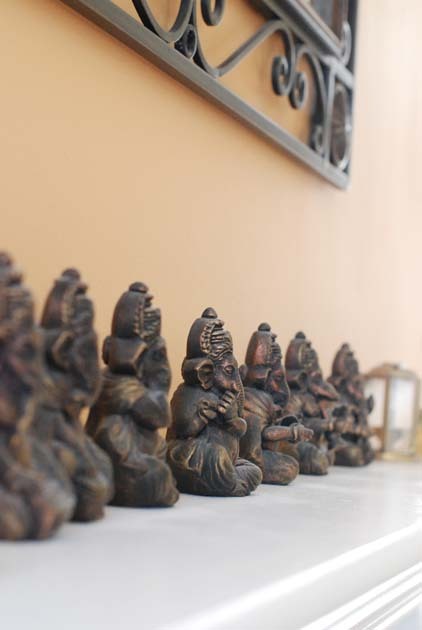 Be ready to hear diverse opinions abut how good, or how bad or how ordinary it is. Also be ready to answer any questions about your before life, after life, price of fish, quality of fish and how Bunty's mother would make it way better. The Himalayan Pink salt is not important to this recipe. The sweet peas are. So is the corn. I threw in the Himalayan Pink salt because it sounds hippie chic and also because I bought it very cheap at Costco. I think Saindhav Lavan is how this Himalayan Rock Salt, mined in the Khewra salt mines at the foothills of Himalaya, was known to us in India. The Kala Namak which is more popular in India and is known as "Beet Noon" in Bengal, is a chemically transformed version of the Himalayan rock salt. Though these days Kala Namak is synthetically produced and there is no trace of Himalaya in there. This Pink rock salt, looks like an original. Raw and unprocessed. I will keep my fingers crossed until someone crashes my delusion only to confirm that the cheaper Costco version was actually made in some lab in China. Until then, here is this easy sweet peas and corn snack which will be packed for BigSis's lunch tomorrow along with ravioli. Whether you want regular salt, Himalayan Pink salt, Kosher salt or Kala namak is up to you. Steamed sweet peas sauteed in butter was one of my favorite childhood snacks. Sometimes diced carrots and potatoes would be thrown in. At other times a chopped boiled egg. Sprinkle of black pepper and salt were the only seasonings. And it tasted so good that I care to make it again and again. Only this time I did a tempering of Curry Leaves and Cumin seeds. 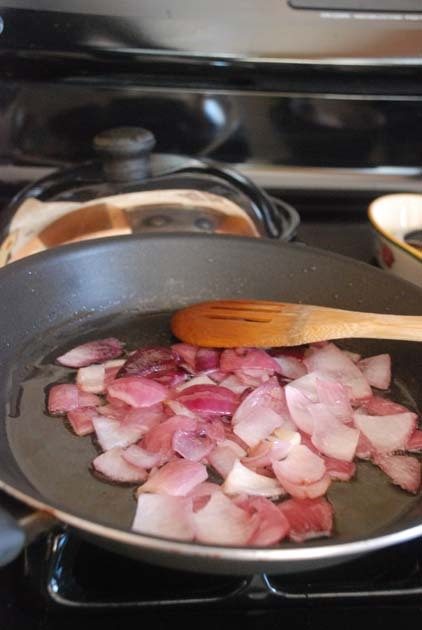 You can ditch both and saute in just plain olive oil or butter too. 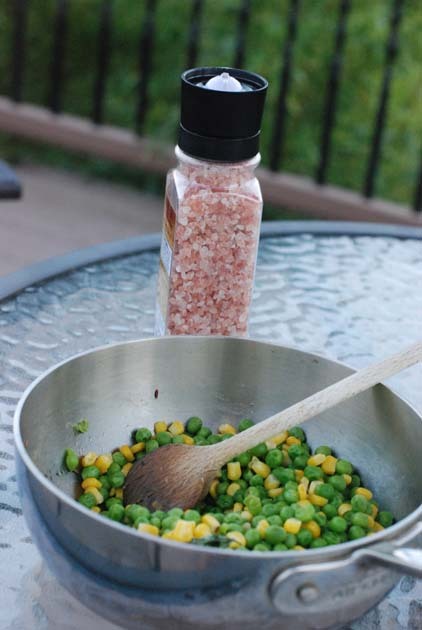 Cook 1 cup of frozen peas and 1 cup of frozen corn kernels in microwave. Usually 1 min for 1 cup cooks mine. Now heat a tsp of Olive Oil. Temper the oil with 2 Kari Patta and few cumin seeds. You can add some sliced red onion too but I skipped. 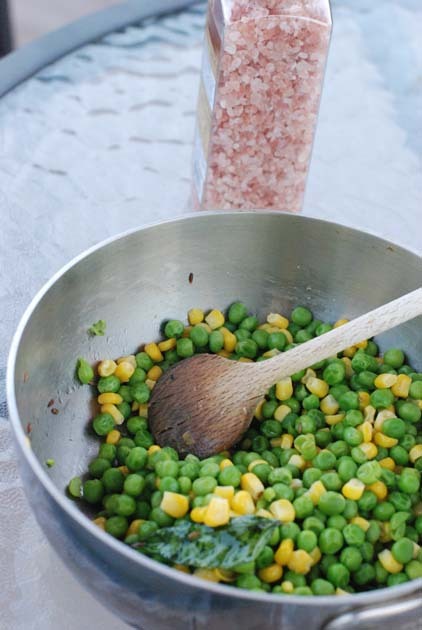 Add the cooked peas and corn. Saute for a couple of minutes. Season with Himalayan pink salt or regular salt. Sprinkle some crushed black pepper. 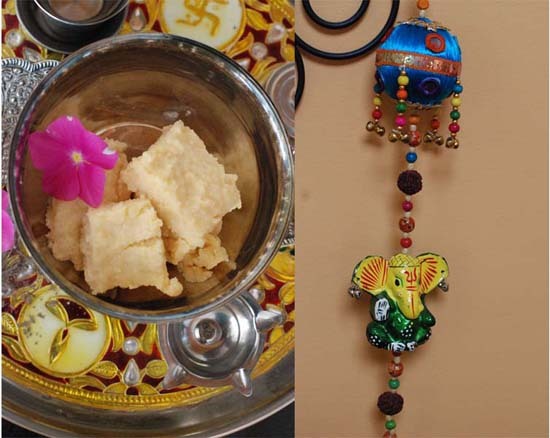 Ganesh Chaturthi was on Monday. It was also the day, both girls started their school after the summer break. Little Sis came back from her half-day KG and happily said "They call it Early Learning Center. But actually there is no learning." I am sure hoping, she thinks it will remain that way. Big Sis too liked her homeroom teacher. But she has a busy schedule with lots of running in between different classes and that too with heavy books and binders. Once the classes start in full swing and band practice etc. begins, she is going have a full day. 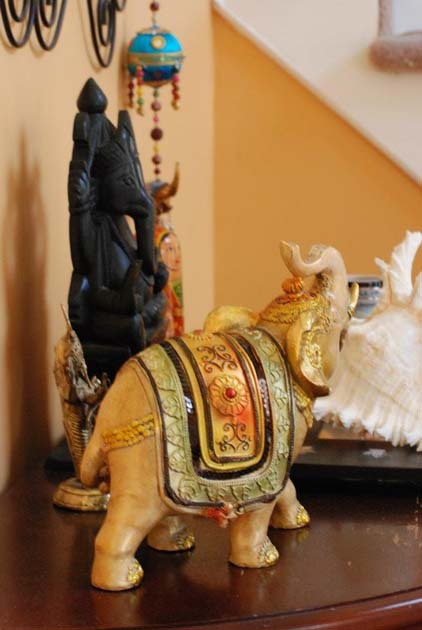 Leaving you with some pictures of Ganesha around my home and may the one with Curved Trunk, Large Body, and with the Brilliance of a Million Suns remove obstacles from our path or show us the way to do so. Next week, I will be announcing some interesting giveaways on this blog. So stay tuned. And don't forget to get your copy of my book.